On a Friday night in December, in a big lodge-like house along the Whitewater River near the Ohio-Indiana border, there’s a celebration going on. Men and women holding Budweisers and Cokes and babies pack the high-ceilinged common room, spilling out onto the deck outside and huddling against the chill around a campfire in the yard. Like the owner of the house, and like the guest of honor, Michael Wehrung, most of the men gathered around the fire are roofers. They are talking about how good it will be to have their friend Wehrung back doing what he does best: climbing up on roofs and estimating the cost of the replacement or repair. Wehrung is usually described in the media as an executive, and he does hold the title of vice president at a Fairfield roofing company, but he wears suits like a punishment and hates sitting at a desk. Even at 54, and despite the glasses, the growing paunch and the beginnings of jowls in his lean face, Wehrung is most at ease in work clothes and in high, outdoor places. At a normal party, he would have been among the tanned and weathered men around the fire, smoking cigarettes, drinking beers and telling stories. However, at this party—his party—Wehrung is stuck in a spot near the front door. Everyone who comes in wants to shake his hand, give him a hug, slap him on the back. His wife, Debi, never strays far from his side. She tells people, “I haven’t smiled this much since we got married.” With the worry lines gone from her face, Debi doesn’t look anywhere near old enough to be recalling an event that occurred 33 years earlier. Mike Wehrung also seems to have shed years overnight, despite his pallor—the result of spending the past two years indoors, once he and his boss had agreed he should not be out climbing ladders and representing the company to the public. The Wehrungs look happy enough to be celebrating the birth of another grandchild. But they’re not. Then a couple walks in: Earle Maiman and his wife, Sharon. The crowd breaks into raucous applause. At the “not” a shout of joy erupted from the defendant’s side of the courtroom. Wehrung threw his head back and exhaled as he stared at the ceiling. Debi burst into tears and her two grown sons, tears also streaming down their faces, encircled her in a hug. Across the aisle, in a row of seats behind the prosecutor’s table, Mel Rebholz’s broad shoulders slumped almost imperceptibly. It was Mel’s sister, Patty, who had been murdered 38 years, three months and 29 days before. 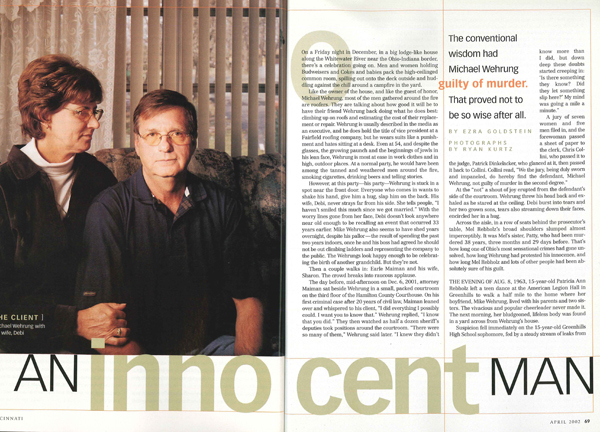 That’s how long one of Ohio’s most sensational crimes had gone unsolved, how long Wehrung had protested his innocence, and how long Mel Rebholz and lots of other people had been absolutely sure of his guilt. THE EVENING OF AUG. 8, 1963, 15-year-old Patricia Ann Rebholz left a teen dance at the American Legion Hall in Greenhills to walk a half mile to the home where her boyfriend, Mike Wehrung, lived with his parents and two sisters. The vivacious and popular cheerleader never made it. The next morning, her bludgeoned, lifeless body was found in a yard across from Wehrung’s house. Suspicion fell immediately on the 15-year-old Greenhills High School sophomore, fed by a steady stream of leaks from investigators to a voracious press. It was said that blood of Rebholz’s type had been found on Wehrung’s pants. That he was “attempting deception” on lie detector tests. That his stories were inconsistent, especially about what he had been doing the night that Rebholz died. By the end of that long-ago August, few people among the hundreds who came to Greenhills each day to gawk at the murder site and the Wehrung home believed Mike’s claims of innocence. And then, on August 31, when Wehrung’s parents and a juvenile court judge named Benjamin Schwartz agreed to make the boy a ward of the state, people accepted investigators’ claims that justice had been blocked and there was nothing more the police could do. The virtual declaration of Wehrung’s guilt and the attacks on Judge Schwartz started up again 36 years later, in the fall of 1999, when Hamilton County Prosecutor Mike Allen announced that he had reopened the investigation into the murder of Patty Rebholz. This time, however, a new generation of law enforcement officials fed the press details from the 1963 investigation that had never before been made public. These included, most stunningly, apparent admissions of guilt to a onetime Channel 9 reporter, Tom Schell, and a long-dead policeman named Chris Waldeck, and a murky tale supposedly passed from Wehrung along a chain of cops about how his “other self’ might have murdered Rebholz in a jealous rage. On top of everything else, there was now the miracle of DNA testing, and investigators announced that they had high hopes for what might be found on long-stored evidence. To all appearances, the long, long mystery of this crime was not who did it but why Wehrung had not been thrown in jail in 1963—or ’73 or ’83 or ’93. That mystery finally seemed solved on May 2, 2000, when a grand jury indicted Wehrung on the charge that he murdered Patricia Ann Rebholz. It may have taken 37 years, but only a few legal formalities now seemed to stand between the roofer-grandfather and a sentence of 10 years to life. But a funny thing happened on the way to penitentiary—a lot of things, in fact, including the almost accidental discovery of crucial evidence that the prosecution had not shared with the defense, which seemed to put the lie to four decades of accepted wisdom. Long before that happened, however, Wehrung the adult did something that Mike the kid had not: He got himself a lawyer. IN MIDSUMMER 1999, Wehrung heard that Allen was inviting people down to his office to talk about the murder of Rebholz. When Wehrung got his own invitation, he politely declined and instead called Bill Martin, the attorney who represented his company. Martin, a partner at Thompson Hine, had been a Cincinnati teenager himself in 1963 and knew all about Rebholz and her alleged killer. But he liked Wehrung and agreed to help, and together the two men started looking for an attorney seasoned in criminal law. Martin knew they were up against a hard place. Few lawyers would be keen to take on a high publicity case against the Hamilton County prosecutor, who rarely lost. Also, the case threatened to eat up hours and brainpower, what with its complex issues of jurisdiction (whether it should be tried in juvenile or adult court) and evidence (sorting the provable and admissible from rumor and hearsay after so many decades). Finally, Martin took his files to Earle Maiman’s glass-walled office, overlooking the Ohio River and Cinergy Field. Jim Perry, a lawyer in private practice who had been defending people for 40 years in Hamilton County courts, agreed to advise Maiman on the procedural aspects of criminal law, and the defense team was in place. Maiman would try the case and take the lead writing motions, briefs and responses. Martin would act the role of chief investigator. And then Martin and Maiman won their first scrimmage: convincing their partners that they should not abandon a client in need, even one charged with murder. That was no mean feat at Thompson Hine, named one of the best corporate law firms in America by Corporate Board Member magazine last year, but hardly known for its criminal defense work. That would be virtually the last fight the defense team would win for the next two years. First they protested the case’s assignment to Hamilton County Common Pleas Judge Patrick Dinkelacker, arguing all the way to the Ohio Supreme Court that it was a violation of Wehrung’s constitutional rights to apply retroactively a state law passed in 1996—which would have Wehrung tried in adult court—to someone who had been a juvenile in 1963. They lost on every level. They tried to get the case dismissed for pre-indictment delay, claiming that Wehrung’s ability to defend himself had been “substantially prejudiced” by the passage of time and the death of witnesses, and that the state had “no legally satisfactory justification for its extraordinary delay.” Dinkelacker didn’t agree. The judge did side with the defense on one issue: ruling that the “other self” statement, which had been widely circulated to the press by the prosecutor’s office, was inadmissible (the statement eventually entered the record through other testimony). Another ruling, however, might have cost Wehrung his freedom, if luck had not intervened: the judge agreed with the prosecutors that they did not have to show Maiman the case file put together by the police in 1963—a file that turned out to contain evidence crucial to the defense. But even as they mostly lost in Dinkelacker’s courtroom, the defense was getting important breaks on other fronts, including the discovery of critical fissures in what had seemed like an impregnable prosecution case. Maiman reasoned that, even in 1963, investigators knew they had nothing that would stand up in court and that is why they had not arrested Wehrung. He further reasoned that Schwartz intervened to control a situation in which a juvenile was not being treated fairly or, possibly, even legally. The defense got another important break from an almost impossibly unlikely source: Patricia Wehrung, who is married to Michael’s son Dave. When she heard about the reopened investigation, she went to her father-in-law with a complicated story. She had vague memories of something a friend had told her years before, about how the guy she was dating had a friend whose mother said she knew who killed Rebholz. And it wasn’t Wehrung. At first, Armstong was reluctant to talk, but Patty Wehrung was persistent, and finally Armstrong gave in. “She told me she had been stalked by a boy that same night that Patty Rebholz was killed. I asked her if she knew who came up behind her that night and she told me yes.” The defense could now argue before a jury that Wehrung should not have been the only suspect in 1963 or 1999. That argument got an unexpected boost from a man named Barry Hatfield, who grew up in Greenhills but now lives in Vienna, Virginia. A friend had sent Hatfield a clipping about the reopening of the Rebholz investigation. He contacted the Greenhills police and repeated a story he had told them the day after the murder. He was playing hide-and-seek the night of Aug. 8, 1963, and saw Patty walk by, he told the police. She was trailed by a boy with slicked-back hair, wearing dark pants and black glasses with chrome ear pieces-a boy who was neither Wehrung nor, he now insists, the boy who had followed Armstrong. Later, Hatfield called Jim Perry to tell him the same story. And then, perhaps most important of all, there was Richard Kuhlman, a Los Angeles actor, director and would-be writer who may have secured, however circuitously, Wehrung’s freedom. In a profile in The Cincinnati Enquirer Kuhhnan described reading the old police files, so it did not take a lot of snooping by the defense team to determine he was someone they should talk to. The actor, convinced of Wehrung’s guilt, had been assisting Mike Allen with the prosecution case. But he agreed to send Maiman copies of the copies he had made in 1991—part, at least, of the case file that the prosecution had refused to share with the defense. Maiman spoke nearly twice as long, challenging Allen—and 38 years of accepted wisdom—point by point. Moving figures around on a huge, mounted map as illustration, he said the defense would prove that Wehrung could not, physically, have been present at the murder scene. He challenged Allen to produce the evidence to support his charges about the blood, pounding on the lectern as he intoned, “There was no blood on Mike’s pants. There was no blood on Mike’s shirt. There was no blood on Mike’s shoes. None. Zero. No blood.” And Maiman challenged jurors to ask themselves why statements allegedly made to Tom Schell and then supposedly relayed to the police had not led to Wehrung’s arrest in 1963. Allen and Chief Assistant Prosecutor Mark Piepmeier presented a string of witnesses who had been at the dance or the Wehrung home the night Rebholz was murdered—middle-aged lawyers questioning middle-aged witnesses about a distant past. Two witnesses said they had memories of Rebholz leaving the dance alone and heading for Wehrung’s, with no one following. Other witnesses remembered seeing a cut on Wehrung’s wrist the next day. One man recalled how, when he had been a boy hanging out with other boys, Wehrung had struggled to explain how Rebholz’s blood might have gotten on his pants. These witnesses offered Wehrung no alibi, but neither did they say anything directly incriminating, beyond remembering, with varying degrees of conviction, that Wehrung had a temper. Three other witnesses did not treat the accused so gently. One was a woman named Diane Blackburn, who said that her fellow cheerleader had told her the day she died that she planned to break up with Wehrung that evening so she could go out with a boy named Tom Stonefield. Was this a motive? There was the videotaped deposition by now-retired newsman Tom Schell, who had been a Channel 9 reporter in 1963 and who claimed to have heard Mike Wehrung admit that he’d hit Rebholz some three weeks after the murder. (Schell was unsure of the exact date.) “And then I asked him, I said, ‘Did you hit her?’ ” recalled Schell. “And he said, ‘I slapped her,’ and he made a motion like this.” The back of Schell’s hand swept chillingly across the video screen. Rapt jurors sat, literally, on the edges of their seats, staring at the monitor. Then there was the third witness damaging to the defense, the only actual 15-year-old to make it to the courtroom—the disembodied voice of Wehrung himself, caught on a Dictaphone on Aug. 9, 1963, the day Rebholz’s body was found. The jury heard a stumbling and inconsistent teenager trying to explain away blood his interrogators told him had been found on his pants, and offering various explanations about how he might have gotten a cut on his wrist. In a courtroom that seemed to grow more tense by the moment, Maiman countered the prosecution witness for witness. Dale Boyd, a neighbor and boyhood friend of Wehrung’s, testified that he had seen the cut on the defendant’s wrist early in the afternoon of August 8, hours before Rebholz was murdered. Tom Stonefield told the jury that he had indeed asked Rebholz to break up with Wehrung so that they could go out, but that had been three weeks before she died, and he had not talked to her since. Joan Burke, a serologist at the Hamilton County Coroner’s Office, testified that she had found no blood on clothes supposedly worn by Wehrung the night of Rebholz’s murder, and only blood of Rebholz’s type and Rebholz’s DNA on hers. Burke also had found no record of blood tests performed in 1963. In an example of how heated the back-and-forth between defense and prosecution had become, Piepmeier tried repeatedly in his cross-examination, over Maiman’s objections, to get Burke to admit that there might have been blood on Wehrung’s clothes that deteriorated over time. Barry Hatfield testified about the boy he had seen following Patty the evening of Aug. 8, 1963, how he had told his story to the police the next day, and how that had been the last he had heard of it. In his closing, Piepmeier would ridicule Hatfield’s testimony as the fevered imaginings of a then-11-year-old. Bonnie Davis Armstrong told the jury how she had left the same American Legion dance that Rebholz had attended and walked down Ingram Road, the same route Rebholz followed sometime that same evening. Sensing someone behind her, she quickened her pace, but her pursuer caught up with her and laid his hand on her shoulder. She burst into a run that took her all the way home, a few blocks away. She told her mother, who reported the story to the Greenhills police the next day, after she heard about Rebholz’s murder. The Davises never heard back from the police. It is possible that the defense did not win the case but that time lost it—that, in the absence of physical evidence linking Wehrung to the crime, it was virtually impossible after nearly four decades for prosecutors to prove his guilt beyond a reasonable doubt. Or perhaps the testimony of Hatfield, Armstrong and Conrad was sufficient to tip the balance of reasonable doubt in Wehrung’s favor. But the defense team thinks they did far better than that. They believe they proved Wehrung’s innocence, and that they did so, ironically, with the testimony of two men called as prosecution witnesses: Craig Smith and Steve Tillett. According to the scenario presented by both defense and prosecution, Rebholz called the Wehrung home from the American Legion Hall on Winton Road around 9:30 p.m. to say she was coming over. The walk, down Ingram and across Jennings to 6 Illona Dr., should have taken Rebholz about 10 minutes. Wehrung’s sister, Cheryl, took Rebholz’s call upstairs, while Wehrung finished a Ping-Pong game in the basement rec room. Several of Wehrung’s buddies were in the basement with him, including 14-year-old Steve Tillett. After the Ping-Pong game ended, some kids went home. Others, including Tillett, got into a car to pick up hamburgers at Henry’s, a drive-in a couple of miles south on Winton Road. Wehrung stayed with his mother, father and 6-year-old sister, Rene, to wait for Rebholz. At about the same time that Rebholz spoke to Cheryl, 15-year-old Craig Smith left work cleaning a doctor’s office in the Greenhills Shopping Center, approximately the same distance from the Wehrung home as the American Legion Hall. In a statement given to police in 1963 and repeated in a videotaped deposition taken Oct. 10, 2001, and played at the trial, Smith described how, as he walked home along Jennings Road, he saw two people in the yard where Rebholz’s body was found. It was too dark to recognize either person, but he could see that one was prone and the other was kneeling. Thinking it was two kids making out, Smith kept walking. A short distance further, at the corner of Jennings and Illona, he saw the car pulling out from in front of the Wehrung home with the teens going out for hamburgers. Tillett gave his videotaped deposition in Pensacola, Fla., on Sept. 24, 2001, and the video was shown to the jury by the prosecution as part of its case on November 28. On the video, Assistant Prosecutor Piepmeier can be heard quizzing Tillett about the moments leading up to his departure in the car to get hamburgers. “Did you see Mike at that time?” asks Piepmeier. “No,” answered Tillett. An off-screen Maiman, on cross-examination, asks Tillett whether the prosecution had sent him transcripts of the statements he had given in 1963. No, responds Tillett, although he had asked for them. He tells Maiman he had met with Allen and Piepmeier the day before to prepare for the deposition, and they had not shown him the transcripts. Maiman asks a few more questions, and then comes a dramatic moment that would have done Perry Mason proud: a hand—Maiman’s—comes into the screen holding a sheaf of papers. “Take a look at this,” the defense attorney tells Tillett, and the video camera is turned off—for 20 minutes, according to the counter in the tape’s corner. Maiman had handed Tillett a transcript dated Aug. 11, 1963, 5:45 p.m. It had been among the papers that Richard Kuhllan had sent Maiman but that had not been turned over by the prosecution, which is normally required to share any evidence that might be “exculpatory,” or helpful to the defense. When he comes back on camera, Maiman asks Tillett where, in 1963, he had said he had seen Wehrung as he prepared to get into the car. “In the living room,” Tillett replies, which he says could be seen through a picture window and the open front door. “Would you agree that what you said back in 1963 is probably more accurate than what you’re remembering today?” Maiman presses. “Yes. I would agree with that,” responds the clearly agitated witness. In the courtroom, the video deposition ended, and the defense had its alibi. Tillett had testified earlier that, as the car pulled away, he had seen Craig Smith at the corner of Illona and Jennings. If Tillett saw Wehrung in the living room and then saw Craig Smith seconds after Smith saw the murder taking place, it was physically impossible for Wehrung to have killed Rebholz. Tillett’s testimony came in under the media’s radar; none of the TV stations and neither the Post nor the Enquirer reported it in their coverage of the trial. In an interview after the trial, Allen insisted that Tillett’s testimony was confusing and subject to interpretation, and did not provide Wehrung with an alibi. However, it seemed to strike a chord with the jury. Late in the evening on December 5, midway through their 14 hours of deliberations, they asked to rehear two pieces of testimony: Tillett’s and Smith’s. Several days before the jury began its deliberations, but just after Tillett’s testimony, Maiman placed a call to Richard Ofshe, a sociology professor at the University of California, Berkeley. Ofshe often testifies as an expert witness on coerced confessions, and he was prepared to fly to Cincinnati to explain how an innocent 15-year-old boy could be led to false admissions of guilt, including what Wehrung had told Tom Schell and what was contained in notes scrawled by a deceased North College Hill policeman named Chris Waldeck. Over Maiman’s objections, Judge Dinkelacker was going to let the jury see the unsigned, undated notes in which Waldeck wrote, “While interrogating subject, subject said said [sic] he thought it was him that killed Pat…but he couldn’t remember anything about it.” Maiman told Ofshe he had decided to call neither him nor Wehrung to the stand that he no longer felt their testimony was necessary. “Are you sure?” asked Ofshe. “I’m sure,” said Maiman. But also, perhaps, Wehrung was a victim in 1963 and again in 1999 of a community and a media so convinced that they knew who killed Rebholz that they refused to even consider the possibility that they might have it wrong. Wehrung is back outdoors now, climbing up on roofs, doing what he does best. He considers himself a free and exonerated man. It is the rest of the community that is left looking for answers, still awaiting closure in the tragic death of Patricia Ann Rebholz.